Buddhist youth on a pilgrimage tour to Buddhist monasteries in Ladakh. Photo : Elizabeth Williams-Oerberg. Young Buddhists from the Northwest Himalayan region of Ladakh face a number of challenges amidst a swiftly transforming society. With an increasing emphasis on the importance of education for furthering development in the region, a region officially deemed as ‘backward’ and in need of development by the Indian state, Ladakhi youth are often at the center of discussions as to how the region of Ladakh should pursue a path towards modernization. Ladakhi leaders and parents widely promote and support the importance placed on young Ladakhis to pursue a modern education, yet modern education in many ways is experienced by these youth as a ‘contradictory resource’. 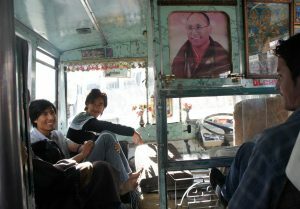 This presentation focuses on young Ladakhi Buddhists pursuing a modern education, many of whom have migrated away from Ladakh to pursue a prestigious higher education, and on how these youth carefully negotiate the challenging context of pursuing a modern education while at the same time being careful to not lose sight of the traditional, cultural and religious heritage of Ladakh. In particular, I look at how young Buddhists negotiate Buddhism in their everyday lives amidst an environment of intensified modernization processes. Young Buddhists, while mostly aligned with modern and global trends especially regarding new media and technologies, are also frequently at the height of concern about the future of Buddhism. How young Buddhists engage with these debates, as well as transnational currents of religious understandings and practices, I argue, helps to illuminate not only the transformation of Buddhism within encounters with modernity, but also the intergenerational and global transmission of religion. What is revealed throughout my presentation are the innovative yet careful efforts to not only maintain the importance of Buddhist cultural heritage in Ladakh, but also to transform Buddhism to become more aligned with their modern, 21 st century lives.